Based on the above descriptions, Ethereum is an open-source blockchain-based decentralized platform featuring smart contracts. Indeed, Ethereum is a programmable blockchain that enables developers to build and deploy decentralized applications. Rather than providing users with a set of predefined applications like bitcoin, Ethereum allows users to create any kind of applications they wish. In this way, it serves as a platform for many different types of decentralized blockchain applications, including but not limited to cryptocurrencies. At the core of the Ethereum platform is the Ethereum Virtual Machine (“EVM”), which possesses its own programming language, known as the ‘EVM bytecode’. It is the runtime environment that executes all of the smart contracts on the Ethereum network. The Smart Contract code is written in high-level programming languages such as Solidity. The code is compiled to the EVM bytecode so that the Ethereum Virtual Machine can understand what has been written. The Ethereum Virtual Machine makes the process of creating decentralized applications much easier than ever before. Instead of having to build an entire blockchain for each new application, the EVM enables users to develop decentralized applications all on one platform. Cryptokitties is one of the most well known decentralized application (dapp) among many dapps developed so far. You can check out lots of interesting dapps at https://www.dapp.com/. 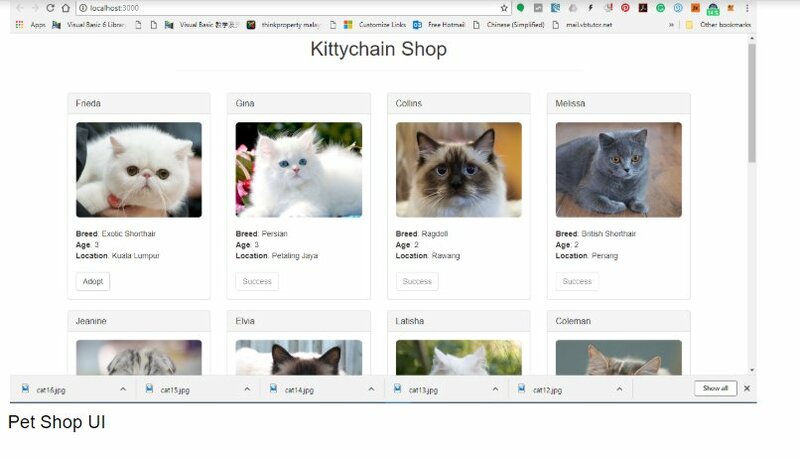 I have also developed a prototype dapp that I named it Kittychain Shop. In this virtual pet shop, the user can adopt a kitty, as shown in the figure below. Ethereum runs on a distributed public blockchain network. Each and every node connected to the Ethereum network helps to maintain and update the blockchain database. The nodes of the network run the EVM and execute the instructions according to the smart contracts. Ethereum node runs the EVM in order to maintain consensus across the blockchain. Ethereum peers achieve consensus via the proof of work algorithm, which is similar to bitcoin. However, they are planning to shift to the proof of stake algorithm in near future to improve scalability. The consensus gives Ethereum a high level of fault tolerance, ensures zero downtime, and makes data stored on the blockchain immutable and secure. Like Bitcoin, Ethereum allows individuals to exchange cash without involving any middlemen like financial institutions and others. However, Ethereum is more than just cryptocurrency. Beyond financial applications, we can create decentralized applications where trust, security, and permanence are considered important. Among the potential applications are asset registries, voting, governance, Internet of things, supply chain management and more. Similar to Bitcoin, we can also carry out mining activity in Ethereum. However, In the Ethereum blockchain, instead of mining for bitcoin, miners work to earn Ether, the default currency of Ethereum. Beyond a tradeable cryptocurrency, Ether is also used by application developers to pay for transaction fees and services on the Ethereum network. For example, the user needs to pay for acquiring a crypto asset in a dapps marketplace using Ether. Previous Previous post: What is Merkle Tree in Blockchain?